I saw this one today in New York, its call "Clocky". Clocky is an alarm clock designed for people who are addicted to hitting the snooze button on your alarm clock. 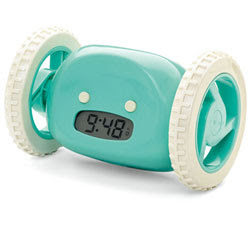 When the snooze alarm is pushed, Clocky rolls off the bedside table, tumbles to the floor and, thanks to shock-absorbing materials and rubber wheels, races away from the bed. It bumps into objects, repositions itself, and eventually comes to rest in a place far enough away from the bed that its owner will be forced to get up to find it when the alarm sounds a second time. A built-in microprocessor randomly programs the clock's speed, distance, and routes, so that it won't land in the same spot twice. This is a great invention, although I can picture myself getting aggravated with it, hunting it down and shooting it one morning. Great idea and I laughed for 20 minutes when I saw it. I am a light sleeper. I jumped out of bed on the first beep every morning!!! one good creation.. but i wonder is it useful for people who really can't wake up in the morning even with their alarm..
haha, i need this clock! lol.